Lilac Pipe is the ideal solution for water conservation and gray water systems, with specialized coloring and marking. Potable water is a valuable resource: why flush it down the toilet? Aquatherm Lilac Pipe is a safe and distinct choice for gray water service because PP-R isn’t affected by aggressive water. Gray water service for flushing and irrigation is a great way to reduce a building’s water usage and can help contribute to green building rating systems such as LEED. Gray water has a variety of water qualities and can be very aggressive, making Aquatherm Lilac Pipe is the perfect choice for gray water service. 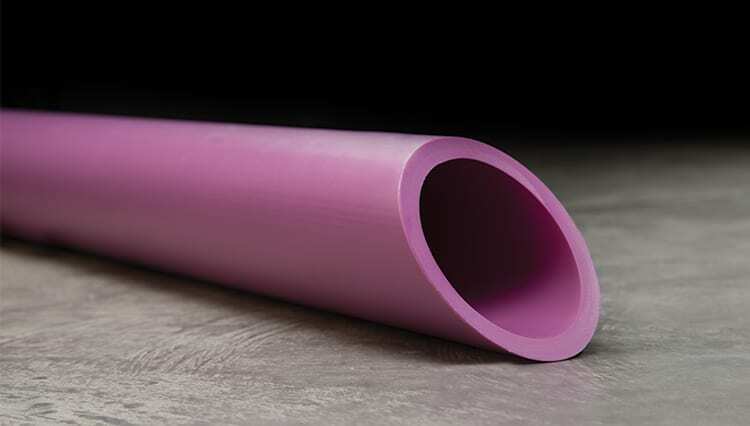 Aquatherm Lilac has all the advantages of Aquatherm’s other piping systems, like PP-R construction and heat-fused connections, so it doesn’t suffer from corrosion or scaling. Aquatherm Lilac has a distinct purple color to help keep the gray water separate from the potable, but still uses Aquatherm’s full range of fittings and is and is also certified by NSF for compliance with CSA B137.11. It can be installed indoors and outdoors, and is safe to direct-bury for irrigation applications. SDR 11: 1" - 4"
Since Aquatherm pipe won’t corrode, scale, wear out, or clog, and hard water doesn’t affect the piping it was the perfect pipe for the job – and less expensive than copper. Green Pipe, Blue Pipe, and Lilac were deployed for domestic, radiant, and rain water distribution, resulting in savings and ecological benefits.